Is abc.xyz a Google Leak or a Spectacular Coincidence? Just in case you’ve been asleep all afternoon, Google just dramatically changed their corporate structure by creating a new company called Alphabet. 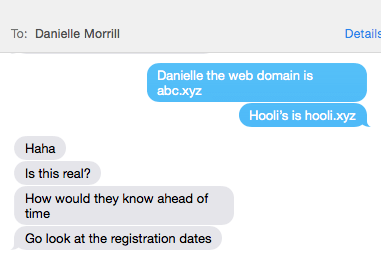 It didn’t take long for the Internet to take note of Alphabet’s unique domain name, “abc.xyz,” which Marco Arment noticed is peculiarly similar to the domain name of the mythical company from HBO’s Silicon Valley, Hooli. This is all of the information I have, but it begs the question: has Google Alphabet had a leak since July of 2014, or is this a spectacular coincidence?